Do you spend countless hours trying to build your business on social media only to come up short? If so, you’re not alone. Stop using the techniques and networks that don’t work and discover how to leverage the power of social media to monetize your efforts, save time, and grow your business! 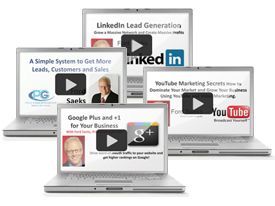 Join business growth innovator and Internet marketing expert Ford Saeks in four content-packed videos that walk you through exactly what you should be focusing on and how to produce measurable results, all using social media. Build authority and trust with your prospects, get better rankings, dominate your market, experience positive results and so much more, with Ford Saeks’ Social Media Success Bundle!